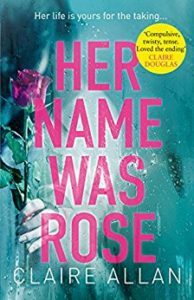 I’m so pleased to be reviewing Her Name Was Rose by Claire Allan today. I also have an extract from the beginning of the book to share with you. 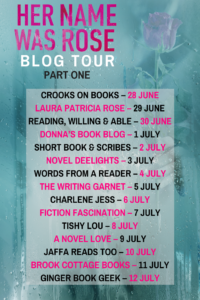 My thanks to Sabah Khan from Avon Books for the place on the tour and the review copy. You can buy the ebook for just 99p and it’s also available in paperback. Her Name Was Rose is one of those big books of the summer. I keep seeing it everywhere on social media. And it’s a really great read. Emily is damaged from a previous relationship with a man, so when she sees Rose Grahame knocked over and killed in front of her it hits her hard, especially given that she let Rose go ahead of her. Should it have been Emily whose life was snuffed out in the blink of an eye instead? 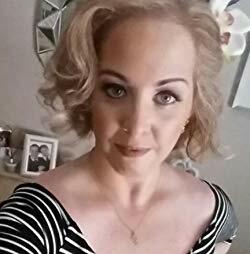 Emily becomes obsessed with Rose, with looking at the outpouring of grief on her social media channels, and she has an awareness of Rose’s husband, Cian, and young son, Jack. I love the idea of Emily feeling that Rose’s death left a vacancy. But it’s not simply a case of stepping into Rose’s shoes. Is Rose’s life what Emily really wants or needs? I feel that what I’m writing is putting Emily across as conniving, making it sound as though she sets out to simply take over where Rose left off, but she’s really not. She’s just mixed up, messed up and lonely, looking for happiness. I liked Emily and wanted that happiness for her. I thought this book was a slow burner at first, setting the scene and introducing all the characters, mostly people that Rose knew. And then it really got into its stride and had me hooked, watching from afar whilst Emily got more and more involved in Rose’s old life. I read in semi-horror, thinking that things surely couldn’t be that simple. Well, you’ll need to read for yourself to find out whether Emily’s involvement in Rose’s old life was to her advantage or not. I thought there was a great turn of events towards the end, totally unexpected and really well done. And the ending itself was perfect, I couldn’t have asked for more. Her Name is Rose is an accomplished, believable and intense psychological thriller and I enjoyed reading it very much. I stood there for a few minutes – maybe less. It’s hard to tell. Everything went so slowly and so quickly and in my mind it all jumps around until I’m not sure what happened when and first and to whom. I moved when someone covered her – put a brown duffle coat over her head. I remember thinking it looked awful. It looked wrong. The coat looked like it had seen better days. She deserved better. But it broke our stare and an older lady with artificially blonde brassy hair gently took my arm and led me away from the footpath. ‘I was just behind her,’ I muttered, still trying to see my way through the crowds. Sure that if I did, the coat would be lifted in a flourish of magic trickery and the lady would be gone. Someone would appear and shout it was an elaborate trick and the lovely woman – who just minutes before had been singing ‘Twinkle Twinkle’ to the cooing baby boy in the pram as we travelled down in the lift together – would appear and bow. But the brown coat stayed there and soon I could hear the distant wail of sirens. There’s no need to rush, I thought, she’s going nowhere. ‘I’ll get you a sweet tea,’ the brassy blonde said, leading me to the benches close to where the horror was still unfolding. It seemed absurd though. To sit drinking tea, while that woman lay dead only metres away. ‘I’m fine. I don’t need tea,’ I told her. ‘For the shock,’ the blonde said and I stared back blankly at her. This was more than shock though. This was guilt. This was a sense that the universe had messed up on some ginormous, stupid scale and that the Grim Reaper was going to get his P45 after this one. Mistaken identity was unforgivable. I looked around me. Fear piercing through the shock. There were so many people. So many faces. And the driver? Had I even seen him? Got a glimpse? Could it have been him? Or had he got someone else to do the dirty work, and he was standing somewhere, watching? It would be more like him to stand and observe, enjoy the destruction he had caused. Except he’d got it wrong. She’d walked out in front of me. I’d let her. I’d messed with his plan. I’d smiled at her and told her to ‘go ahead’ as the lift doors opened. She’d smiled back not knowing what she was walking towards.